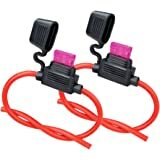 Amazon's Choice for "30 amp fuse holder"
This ATC and ATO inline waterproof fuse holder is compatible with any ATC and ATO blade Fuse. The deluxe waterproof body and water resistant cap is ideal for marine applications or any application that is continually in wet environments. Nilight designs and manufactures one of the best high quality led light bar in the world. 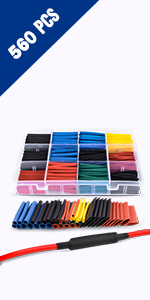 We stand behind our products and serve our customers in different countries. We dedicate ourselves to build up a long-lasting relationship with each customer. 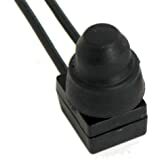 Type: In-line ATO/ATC fuse holder. Fit for fuse dimension: 19.1 × 18.5 × 5.1 mm. 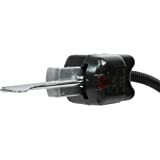 It features a water resistant cap and a loop 12-gauge insulated wire. Specially designed cap for tight sealing, efficiently prevent water and dust from entering, upgrading waterproof performance. 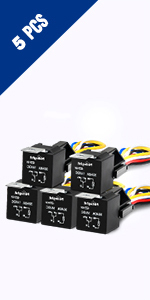 Fit Fuse: ATC/ATO blade fuse of 1A, 2A, 3A, 4A, 5A, 7.5A, 10A, 15A, 20A, 25A, 30A. 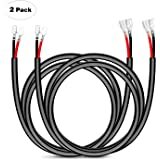 This is a heavy duty wiring harness with wire gauge of 12 AWG. 1.0 out of 5 starsLooks like an electrical fire all ready to go. As Eastwood would say, "Feel Lucky Punk....?" First thing, I didn't realize is that this item was coming direct from China. So if you need this part soon, go to an auto parts store and pay a couple bucks more. From there it goes all downhill. I'm not even going to waste my time using the part. When I opened that fuse holder, which may or may not be waterproof, the connectors are not lined up. 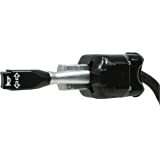 One connector is easily visible, and tight against one side, and the other is covered/filled with rubber, and offset against the other side. 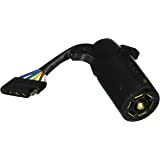 I am thinking that once I clean the rubber out of the one side of the connector, I would have to bend the legs on the fuse, one forward, with a twist, and one backwards with a twist in the opposite direction just to get it to fit in the holder. I guess I could risk that everything else encased in the rubber wasn't going to short out and burn my $40,000 truck to the ground, but I'm pretty sure this item will be much safer if I install it in the nearest trash can. This item is pure junk, and from the workmanship, or lack there of, I would highly recommend everyone steer clear of this item. Notice the enclosed picture. This is just as I received the item. 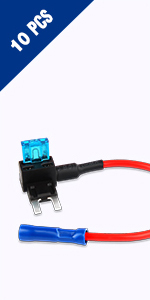 I bought two of these and both housings have melted into a puddle of plastic, leaving the fuse wire exposed and unblown. This happens when internal connections are poor and cause too much resistance. 5.0 out of 5 starsGood fuse holder! 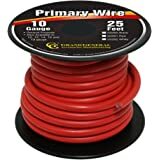 I use these in both personal & work environments - they are sturdy, grip the fuse well, providing good electrical connection (important at a 30 amp load, which the #10 wire is rated), and seal out dust & dirt well. While they are not water-PROOF, they are water-RESISTANT. 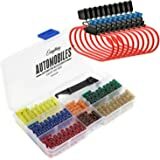 If use in a very wet environment, an electrical-grade silicone grease should be used on the connections and the lid (good to use anyway on any automotive application, especially if you live in the North with rain, snow, slop, etc!). 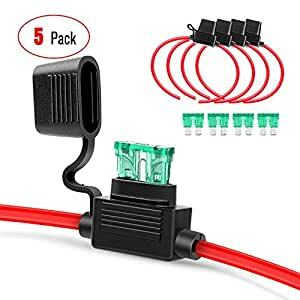 AS someone reviewed, the wire lead is not cut, but rather a loop - which allows you to have the ends the length you wish. 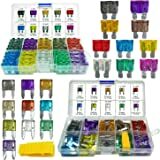 A nice product, at a price far below the auto stores! 5.0 out of 5 starsStrong and Durable. Well-constructed. Overall, this is an awesome product sold by an awesome seller. It even got here before the early arrival date! Pros: Strongly built. Cap holds tight and certainly doesn't risk it falling off. 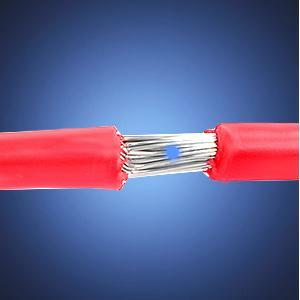 The wire is accurately sized and the insulation casing is very thick and durable. Holding it, it's very heavy for what it is, the actual holder is super thick and rigid with no doubts of the cap falling off. Cons: This doesn't apply to my situation, but may apply to others. Though the cap fits snug, there is no visible seal, so I question its resistance to water. Now, this is not failure in description. Note that the title says "Water-RESISTANT...not Water-PROOF." I question it's ability to hold out water, but I certainly don't question it's ability to resist corrosion. 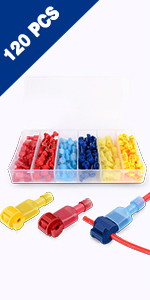 The internal spade connectors look to be gold-plated tin, which should remain resistant for many years to come. The cap does provide the benefit of keeping water penetration to a minimum if it were to find its way in. If it's ever a worry of ANY water getting in, it wouldn't be a big deal to throw a film of RTV sealant around the lip the cap seals against. Personal preference. The big picture: Awesome product, awesome seller, quick shipping. Would certainly buy this product from this seller again. 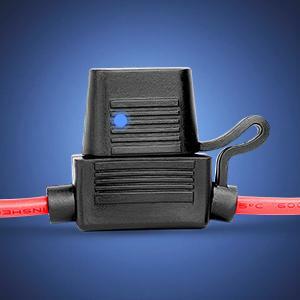 This is a well constructed unit with the cap sealing down over the fuse, and the inner conductor covered by a very resilient material that will withstand abrasion and heavy use. It is a very heavy conductor too; listed as 10 gauge, I work with wire every day and would guess it heavier than that. 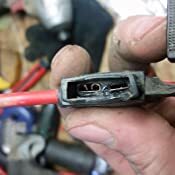 Having said that, being heavier isn't a bad thing, when you are looking for circuit protection, you certainly don't want your fuse holder melting! 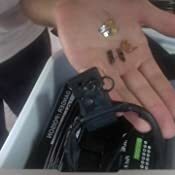 My problem was that I was looking for a small circuit protection device. 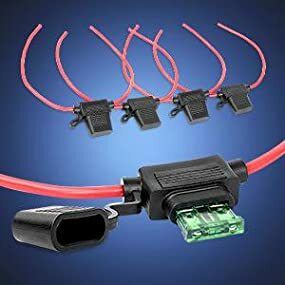 I didn't care that it was 10 gauge; I have connectors for that. 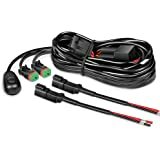 When I got this though, my connectors did not come close to fitting (the conductor was too large), so I did not use it. I used a small in-line holder instead, but this is still in my toolbox, because it will certainly handle a bigger (higher amperage) project in the future. 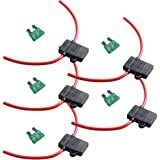 I would recommend it if you need something for higher amperage circuits requiring upwards of 30A of protection. 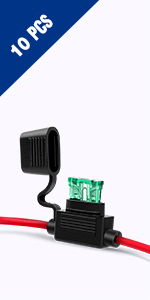 Otherwise, keep in mind that you will need to have correct connectors for this large conductor. 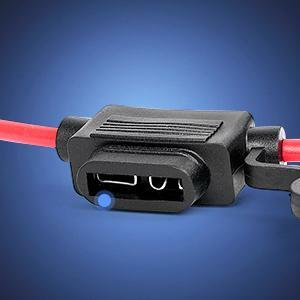 PLEASE do not do like another reviewer and trim strands from the conductor to make it fit your connectors! Just keep in mind the size of the circuit you need to protect and get the correct parts. 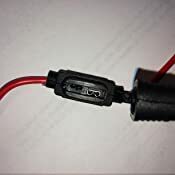 This part WILL work fine for lower amperage fuses and projects, but you will need to find parts to fit it into your existing circuit, unless you settle for simple wire nuts, and that would negate the waterproof/water resistant factor. Enjoy! I mostly gave it 1* because of false advertising. 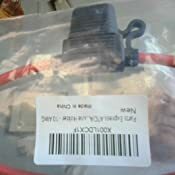 The photo shows that it comes with a fuse, and it does not. It was also exceedingly difficult to insert a fuse into the holder. It took me several minutes of pushing very hard and wiggling until it finally got started into the clips. I will use it and I expect it to perform properly, but I would not order another one. Be sure to read the shipping time estimate. It took 36 days to get here.